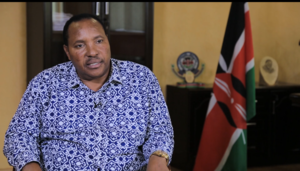 Two reformed members of the Kaa Sober programme that was last year launched by Governor Ferdinard Waititu Babayao have tied the knot. The two members, Peter Gachie and Metrine Sikuku from Rukuma in Lari Kirenga wedded on Saturday in a colourful ceremony attended by hundreds of Kiambu residents and a section of county leaders led by the Youth Affairs, Sports and Communication CECM Karungo Wa Thang’wa. The wedding took place at Last Days Apostolic Ministries Church in Kikuyu. Gachie joined the Kaa Sober programme last year in March after months of indulging in deep alcoholism having lost his father and grandmother in two tragic incidences. He turned into alcoholism as a remedy for his stress, but it turned alarmingly harmful after he got addicted and his health deteriorated. “My son had become a major worry to us because he was hardly at home and when he came he always caused disturbance to the entire neighbourhood,” his now jubilated mother says. The mother says that she was getting depressed after her son and started going astray. Gachie had at some point amid his stupor confided to his mother that he was contemplating suicide. “This young man could hardly take a bath, leave alone the thought of doing a wedding,” his mother says in a straight face. She heard of the Kaa Sober programme that was ostensibly transforming lives through rehabilitation and creation of employment. She really wanted her son to join the group. “I tried to convince him to join Kaa Sober but this fell on deaf ears. It took the efforts of our neighbours and friends to convince him to join the programme,” she says. Kanyeki Tharau, a friend and neighbour to Gachie is the Kaa Sober coordinator in Rukuma. “I managed to convince Gachie to join Kaa Sober where he met other drunkards who were reforming,” Kanyeki says, “he received guidance and counselling and was given a job to do where he was getting a pay; this gave him hope.” Gradually Gachie reformed and was able to work on his neatness and started helping on domestic chores. After a few months in the Kaa Sober programme, he got born again and joined the Last Days Apostolic Ministries Church in Kamandura where he also volunteers in church cleaning activities. He then met another Kaa Sober member who had been employed by the programme before she got into alcohol addiction. They become friends with Metrine and started courting. Progressively they introduced each other to their respective parents and started planning on the wedding. Gachie used the little money he had saved from the Kaa Sober programme to pay for the bride price. 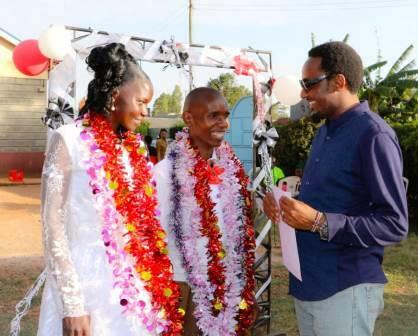 Their main challenge with the wedding plans was funding, but they got assistance from Governor Waititu who donated 100,000 shillings for planning purposes. The couple is looking forward to becoming Kaa Sober ambassadors in the county and to live exemplary lives by starting their small enterprises and bringing up a healthy family. “We shall be mentoring all those who think that transformation is not easy. 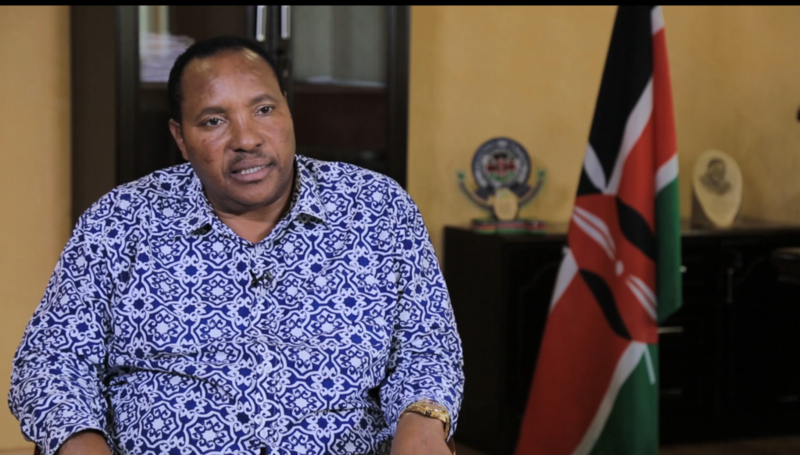 We hope to be a couple that people can look upon for support, thanks to our Governor Ferdinard Waititu,” Metrine says. The courses being offered include ICT, Motor Vehicle Mechanics, Painting, Electricals, Hospitality, Beauty among other disciplines that will not only make them employable but will also impart the skills for self-employment. Painting students will have the opportunity to intern for Royal Paints upon the completion of their courses. There are 35 Vocational Training Centres that are currently training the Kaa Sober members. Successful Kaa Sober trainees will be supported by the County Government to start their own business through loans from the recently initiated Jijenge Fund. Trainees will also be assisted to get employment in various organizations and contractors.